The Ellen Degeneres ShowAlex is overwhelmed by his newfound fame. 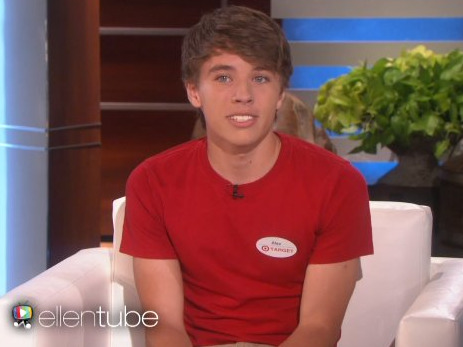 The 16-year-old kid from Texas who became internet-famous overnight as “Alex from Target” is now fearful of leaving his house, the New York Times reports. Alex Lee was unwittingly thrust into the limelight two weeks ago when a photo of him bagging groceries at Target went viral online. Within a matter of hours, he became America’s newest teenage heartthrob. His Twitter account went from 144 followers to half a million in 24 hours. Media outlets and talk shows around the country began contacting him for interviews. He gave his first and only television interview to Ellen Degeneres last week and told her he didn’t know what to do with his newfound fame. Now wherever he goes, he’s met by squealing fans. And at school, kids have been stopping him in the hallways to take selfies with him and post them online, writes the Times’ Nick Bilton. The attention is frightening at times, Alex told the Times. TwitterThis is the photo of Alex that went viral online. Only a couple weeks ago, Alex was just excited to be going on his first date with his now girlfriend. “I really wanted some Chicken Express, and she was like, ‘Hey, we should get some Chicken Express tomorrow.’ And we actually ended up getting Chicken Express the next day,” he told Bilton. Now he and his family are receiving death threats and their personal information, including Social Security numbers, bank accounts and phone records, have been leaked online. For more on Alex’s struggle with fame, go to the New York Times.